I had, quite possibly, the most basic and NON-blog-worthy lunch today. But it wasn't boring. In fact it was quite lovely and delicious - and actually pretty too! Best of all, it was cheap, because all but the bell pepper came from my Mom's or my gardens. This tends to be my default when I'm bored with cooking or just can't think what else to make for lunch. Cut up whatever's in the 'fridge. Add dressing. Call it salad. I like the texture of the large chunks here, but cut things up however you like. 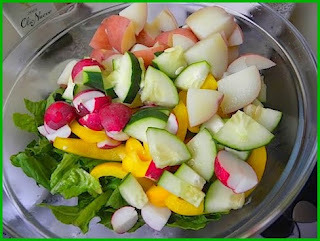 Toss chilled, cut up veggies together, place on bed of torn lettuce greens. Add dressing of choice and serve. I tend to like this with a vinaigrette but a creamy dressing would be good too! Blend all ingredients in a food processor until thick and completely blended. Taste and adjust by adding more salt, pepper, sugar or vinegar if needed. i love cooked potatoes in my salads, and your vinaigrette sounds yummy! I had never thought of potatoes in salad before. Brilliant. You're in the Seattle area, right? Have you had pretty good luck growing bell peppers in your garden? For some reason I'd always assumed they needed more heat than we could provide... this could be an awesome development! Sadly, the bell pepper, as noted, was not from my garden. My folks DO have pretty good luck though - they grow the plants quite large in their green house and transplant only when the weather is warm, early July or so. Most of their peppers are large-egg sized but they get a few larger ones too. Yes yes yes yes yes. When I'm feeling lazy, I just thin out hummus with a bit of water, and use that as a dressing. Check out my blog if ya get a chance! I'm enjoying reading your blog!